Cumberland Island is at the bottom of Georgia, just shy of Florida. It has an interesting history involving Timucuans, a Revolutionary War hero, and, later, Thomas Carnegie, whose huge mansion is now a burned-out shell. Today it’s a National Seashore, with saltwater marshes, maritime forests, a long and beautifully wide beach and no admission charge if you are over 62. 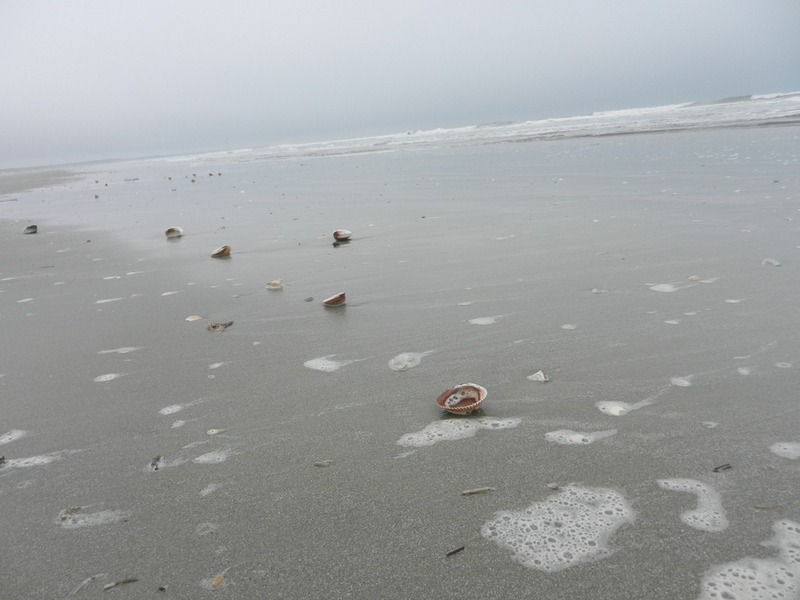 We spent most of a day wandering around, enjoying the beach, and collecting shells. This horseshoe crab was huge. 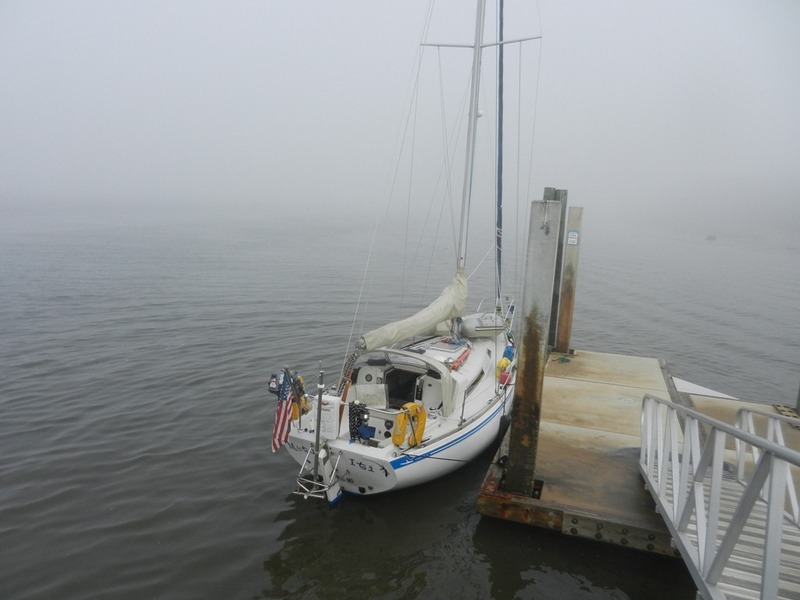 We tried to leave the next morning, but the fog rolled back in after we’d hauled our anchor so we moseyed over to the dinghy dock and hung out there until just after noon when we could finally see the marks. Thin Water: We were only half a mile off the Fernandina Beach dock when we saw a big sailboat aground – right in the marked channel. We approached slowly and very cautiously, wondering whether the deep water was to the right or left of him. Just then TowboatUS arrived and waved us to the left. Good for us, but we were still in really shallow water. So when the towboat pulled him off the bottom and towed him for about 2 miles, we followed right behind. 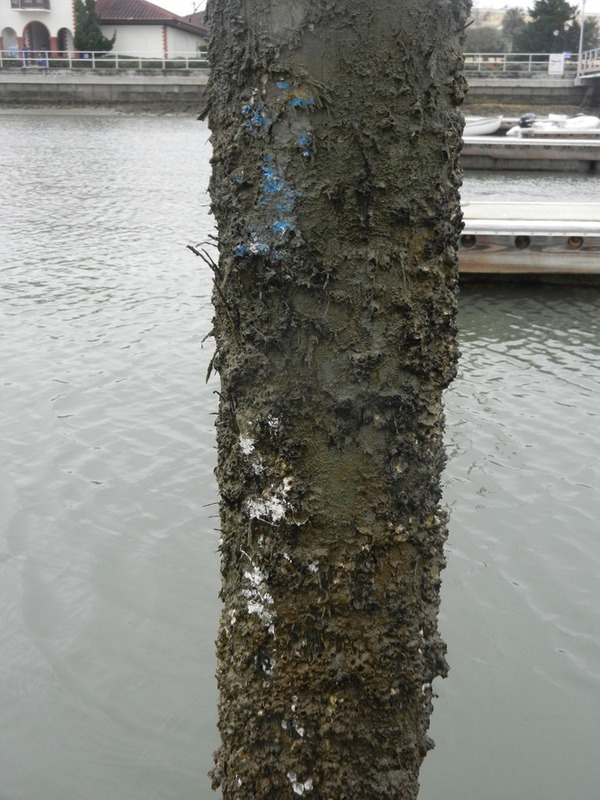 And it was a good thing because the chart said 16 feet and our depth sounder said 8. Motu Iti needs 5 feet of water to float. Well, fair’s fair because when the aforementioned aground boat stopped to do his paperwork with the towboat, we passed him and then he followed us. It didn’t matter whether we slowed way down or steered erratically, he continued to follow us. There were several places that day where we saw 6 feet – made for a nerve-wracking day and very slow progress. Late that same day, almost at dusk, we passed through Sisters’ Creek Bridge and motored into the St. John’s River, right into a thunderstorm. [Just for the record, I wanted to stay at the anchorage at the Bridge, but nooooooo, we had to keep going.] Most of the bad stuff was to our south – gigantic jagged lightning streaks, like huge cleavers opening up the skies ahead of us. It was fearsome. There was a tornado, also to our south. Many thanks to my son-in-law for uploading the radar app to my IPhone so we could track the storm. Finally we are in St. Augustine – a beautiful, very old city. We had a lovely dinner at O.C. White’s, on the waterfront. The mahi was excellent, but they don’t do “Maryland crab cakes” like they do in Maryland. 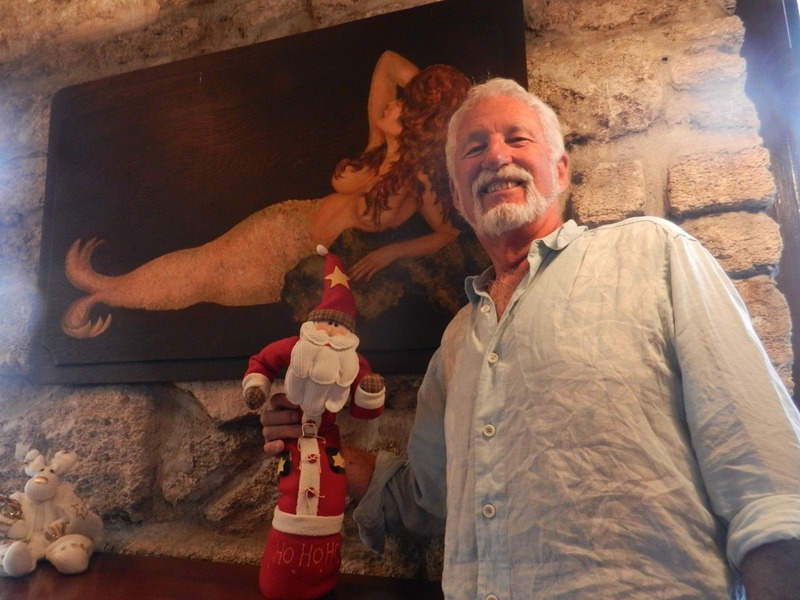 Goldwin said he wanted his picture taken with the little Santa, but I don’t think it was the Santa he found so interesting. We spent one night at a mooring, but came into the dock for the day so we could more easily do laundry, buy groceries, etc. and because it’s so rainy and cool. We have a great view of the city’s holiday lights and it seems they have chocolate shops here and even a yummy bakery downtown, although the closest groceries are a long walk across the Bridge of Lions (so named because of two impressive stone lions that guard the entrance). We felt very, very bad, but clean sheets, hot showers, and a homemade dinner with food that didn’t come out of a can sure helped – oh, and a store-bought key lime pie for dessert. And then to really cheer ourselves up, we skyped with our daughter, son-in-law and granddog. They’re wonderful. We’re still waiting for Florida to make good on its Sunshine State nickname. Maybe tomorrow. 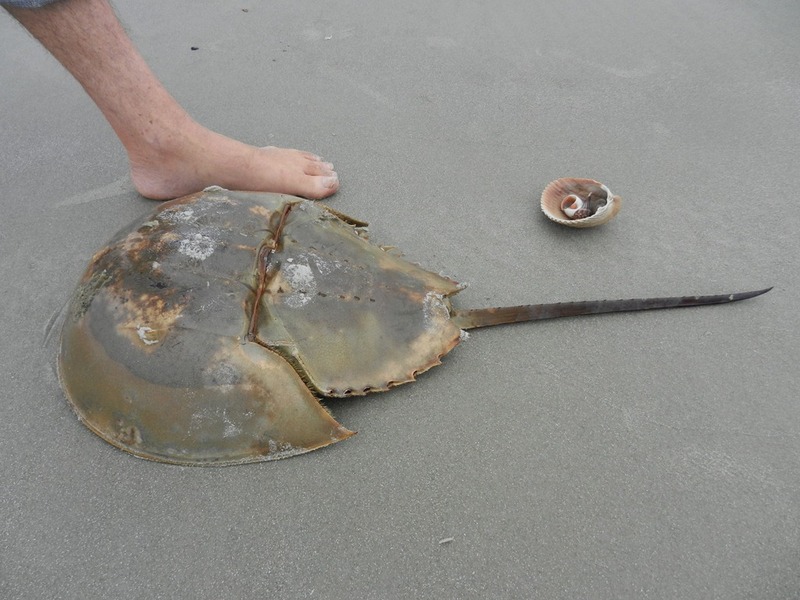 Horseshoe crab. My imagination ran wild at the thought of a huge hermit crab. Your pictures have been amazing. Hahahaha. You always were a better proofreader than me. Key Lime Pie can fix anything! Love you! Great photos. I’m with Velocir…key lime can fix anything. Candy made on my end…sorry you don’t get any but sent it to Velocir instead! Now trying to get food made for a weekend of 21 people! by Christmas Eve may wish I was on a boat with just one other person! :^) Hoping for sun for you altho praying for snow up here! Velocir reports your candy was especially awesome this year. I wouldn’t know. Finally got sun here. ← REALLY Too Much Excitement!! !